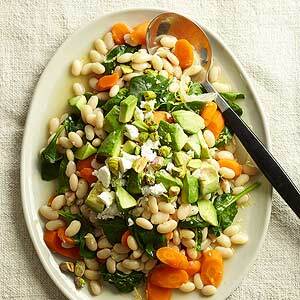 A side salad in the slow cooker: crazy or brilliant? We say brilliant. Add pistachios at the end for some crunch with creamy avocados and tender carrots. Rinse beans; drain. In a 4- to 5-quart Dutch oven combine beans and enough water to cover beans by 2 inches. Bring to boiling; reduce heat. Simmer, uncovered, for 10 minutes. Remove from heat. Cover and let stand for 1 hour. Rinse and drain beans. In a 3 1/2- or 4-quart slow cooker combine the soaked beans, carrots, onion, garlic, oregano, salt, and pepper. Pour stock over mixture in cooker. Cover and cook on low-heat setting for 7 to 8 hours or on high-heat setting for 3 1/2 to 4 hours. If desired, remove 1/2 cup of the cooking liquid; set aside. Drain bean mixture; discard any remaining cooking liquid. Return bean mixture to the hot cooker. Stir in spinach, lemon peel, and lemon juice. Let stand, covered, for 5 minutes. Transfer bean mixture to a serving platter. Top with avocado, cheese, and pistachios. If desired, drizzle with enough of the reserved cooking liquid to moisten. If desired, serve with lemon wedges. Makes 6 servings.